This superbly acted and paced Austrian film is out to prove that us moviegoers have yet to become so accustomed to cinema violence that we have lost our capacity for horror and empathy. 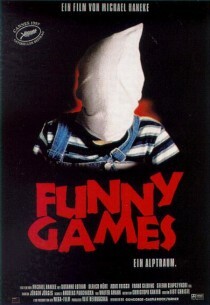 Funny Games is extreme without directly showing much of the violence on-screen. Director Michael Haneke brings up a most disturbing portrait of what some human beings are capable of doing to each other for no other reason than entertainment. Haneke is known for toying with his viewers. On more than one occasion, one of the characters breaks the fourth wall to talk to the audience. This, however, in no way detracts from the powerful unfolding of the shockingly cold events. Susanne Lothar, Ulrich Mühe, Arno Frisch and Frank Giering star in this unforgettable thriller. You can find more information on this German-language film on Wikipedia and IMDb. Do not confuse this film with the 2007 U.S. remake by the same director. The original is better. I saw this one in the theater back in 1997. I’ve never left the theater more shocked than with this movie. Like u said, the power of suggestion exceeds the actual showing of the violence here. I also remember there was almost no music what so ever in it, which in this case made it even more powerful too.